In the bowl of a stand mixer, combine butter and powdered sugar until fluffy. Add egg, vanilla and peppermint extract, scraping down sides of bowl as needed. Reduce mixer speed and add flour and salt, mixing until well combined. In the bowl of the stand mixer, combine 1/2 the cookie dough with red food coloring. Shape cookie dough into disc and cover tightly with plastic wrap. Refrigerate one hour or up to overnight. Once dough has chilled, preheat oven to 375 degrees. Measure one tablespoon of each color dough and gently roll into 6 inch long log shapes. 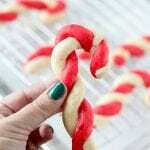 Twist cookie dough together and transfer to parchment paper or silpat lined baking sheet. Chill shaped cookie dough for 15 minutes before baking. Bake 10-12 minutes, or until bottoms of cookies are a very light golden brown. While the cookies are baking, prepare peppermint glaze. Spoon over cookies after they have cooled slightly.